Well, here we are at nearly the half-way point of our contest!! We’ve made it through a few vacations, holidays and family events, and we’ve all survived! We’ve not only survived, but THRIVED! We have almost all had good (and not quite so good) weeks, but we are ALL down from our starting weight – and you can’t ask for more than that!! For week 5, congratulations go out to Susie Q and GleeFull – the only two contestants with a weight loss for the week. Again, do not stress my friends! We are not quite at the halfway point yet and we are all down from where we started, so let’s celebrate our achievements and learn from our mistakes. I had planned to share my new recipe for a Weight Watchers friendly side-salad with you on Saturday, I decided to share it with you here instead. It is a light, cold salad that is high in protein and contains healthy oils at only 3 points (106 calories) per 1/2 cup serving. The photo of the finished salad is at the top of this page. Enjoy! 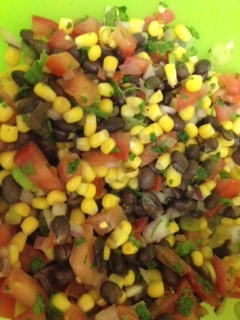 Combine beans, corn, tomato, onion, scallion and cilantro. Mix olive oil and lime juice; drizzle over salad. Mix well and sprinkle with salt and pepper to taste. Marinate in the fridge for 30+ minutes. Add avocado before serving. Note: The salad will keep for days in the fridge, if the avocado is not added until the salad has been plated.